One game we've been particularly looking forward to in 2016 is Street Fighter V. I may be giving my age away a bit to say I can remember when the original Street Fighter burst onto the arcade scene back in 1987. It's true to say this game and it's sequel were true game-changers for the genre. 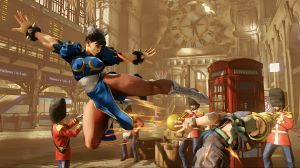 Now with the much-anticipated Street Fighter V released we see a game with a great mix of what made the game great in the first place and a fantastic-high powered game that makes great use of today's technology. The purpose of this guide is to take a deeper look at the individual characters, their strengths, weaknesses and moves. We'll also be taking a look through the game and suggesting strategies and taking a look at unlockables. Capcom have already published a fantastic series of character guides, we'll be referring to these in our guide often and checking out what the best Street Fighter players in the world think about this game. No discussions open for Street Fighter V at the moment.